Private Taxi From Da nang Hue Da nang is one of the most convenient private car transfer service for tourist who would like to explore Hue City from Da Nang by their own way. Hue is a cultural city which is not only famous for charming beauty of Huong River (Perfume River) associated with the symbol of Hue is Truong Tien Bridge, but also has the large number of heritage sites. Especially, The world heritage site – The Complex of Hue Monuments. In the morning, Taxi Danang Airport driver pick you up at hotel lobby in Da Nang, start the Day Trip From Danang To Hue. Firstly, we will enjoy the spectacular views from Hai Van Pass – Sea Cloudy Pass with 500m high above sea level. Besides, while you are on the Hai Van Pass , you can have a cup of delicious Vietnamese coffee at many cafeterias. 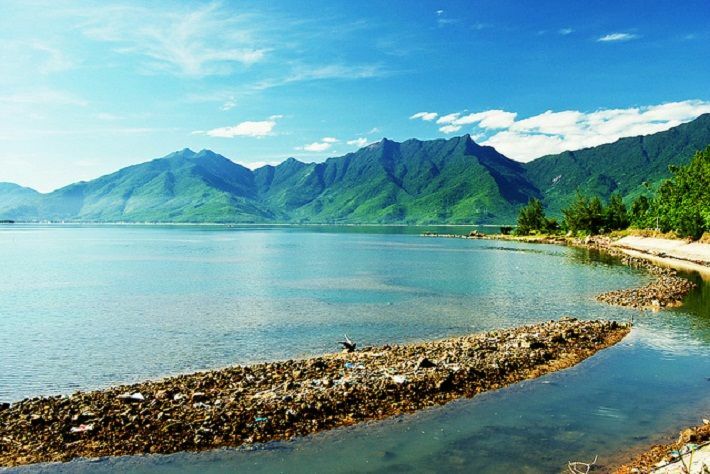 Then, stopping at one of the most beautiful beaches of Vietnam – Lang Co Beach to take some wonderful photos while walking along the seashore, enjoying fresh air before transferring to Hue. Upon arrival Hue, we will visit Khai Dinh Tomb – The palace in the after life of the 12th emperor of Nguyen Dynasty. This is a special tomb with the combination between Western Architecture and Oriental Architecture. 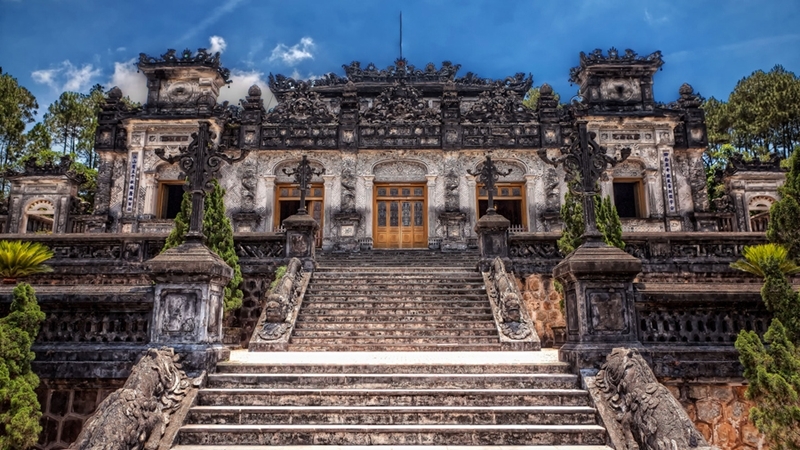 Continue to Tu Duc Tomb – a superb example of Nguyen Dynasty’s architecture. You will have a chance to explore the emperor’s philosophy about the life after life. Have lunch at local restaurant. In the afternoon, depart to visit Imperial Citadel – where 13 emperors of Nguyen Dynasty used to work and live. We will visit in turn of: Nine Holy Canon, Ngo Mon Gate, Court Yard, Thai Hoa Palace, The Temple, The Forbidden Purple City. Leaving Imperial Citadel, we will drive along the bank of romantic Perfume river to visit the last tourist attractions in this itinerary – Thien Mu Pagoda. This is the oldest pagoda in Hue City with more than 400 years old. In 2015, Thien Mu Pagoda was in top of 10 most beautiful pagodas in Asia. Transfer back to hotel in Da Nang. Settle the payment to our driver. End of services. Let’s drop us an email or call via the hotline to enjoy the smoothly day trip with Private Taxi From Da nang Hue Da nang.